Read more about Celebrating the Launch of Mainland Australian Cherries in China! Australia gained market access to China for fresh cherries in 2013, following the signing of phytosanitary protocols. But at first only Tasmanian cherries were allowed to be sent to China by air freight, due to concerns over fruit fly infestation in mainland Australia fruit. Mainland Australian fruit was required to undergo fumigation at sea, during a total 21-day ocean voyage. This essentially shut mainland Australian cherries out of China. The Australian Cherry Launch event was held during the China International Import Expo, and featured speakers from the Department of Primary Industries, Shanghai Fruit Association, Cherry Growers Australia Inc. and Qantas Freight. Also in attendance were purchasing managers and other representatives a range of major Chinese importers, distributors and retailers, including JD.com, Joy Wing Mau, Pagoda, Yonghui and G-Super. 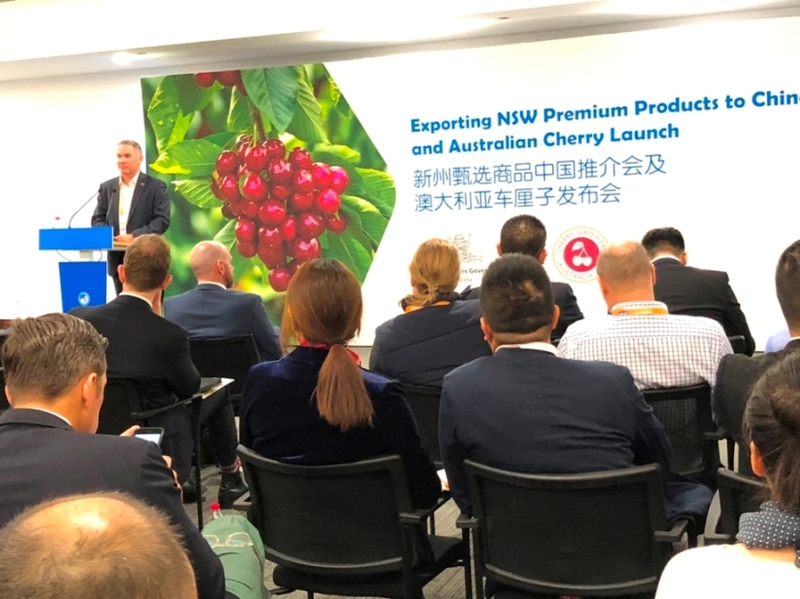 Speaking at the Australia Cherry Launch, New South Wales Minister for Primary Industries Niall Blair praised the cooperation between the New South Wales government and Chinese authorities, especially support from the Chinese side for exporters, including the cherry industry. Blair also pledged to further strengthen cooperation with Chinese authorities in the future in order to bring Australian cherries to as many Chinese consumers as possible. Australia's cherry season runs from mid-October through February, with the main crop in major exporting states starting in the last week of October and going through the end of January. Scott Hansen, the Director General of the New South Wales Department of Primary Industries, explained that the new access for mainland cherries means that consumers in China can now get Australian cherries two months earlier from mainland supply instead of waiting for Tasmanian fruit to arrive in January. Hansen said that all along Australian cherries have been positioned in the high end of the market, and that exports of Tasmanian cherries to China increased more than 300% in the period from 2012 through 2015, with an even stronger growth trend over the most recent two seasons. He is therefore optimistic about the consumer market for high end fresh fruit in China. At the event, Produce Report had the opportunity to taste the samples of mainland fresh cherries provided by the Department of Primary Industries. The cherries were large in size, with excellent color and luster, sweet and crisp; overall, the quality was excellent. Chinese industry guests in attendance were also unanimously impressed by the samples and optimistic about the performance of mainland Australia cherries in China during the coming season. Some importers Produce Report spoke with have already requested lists of Australian exporters, and many others said they are planning trips this December to New South Wales to visit cherry orchards. The first shipment of mainland Australian cherries reportedly has already been imported to China and put on sale. The importer was Joy Wing Mau, which cooperated with ecommerce giant JD.com to market the fruit. Ms Abigail Chen, the imported fruit purchasing manager for JD Fresh said JD bought a relatively small volume of high-grade cherries for the first time offering mainland Australia cherries to its customers. Chen said that although the price was high, the cherries sold out completely via its online platform, receiving excellent customer feedback. She said JD. Fresh will continue promoting Australian cherries and plans to ramp up purchasing volumes starting during the middle of this month. For offline channels, Australian cherries are also being sold at outlets of the Ole supermarket chain. The bulk of cherries exported from Australia come from New South Wales, Victoria, Tasmania and South Australia. According to Cherry Growers Australia Inc., current Australian cherry production volumes are 15,000 tons per season, with about 30% of that volume going for export. But, "this is expected to rise to 20,000 tonnes by 2020, with up to 50% of production exported," the industry board explains in informational materials, continuing: "Approximately 90 Australian growers with 2,000ha under production are registered for protocol markets (markets with strict phytosanitary requirements) such as China, Japan, South Korea, Thailand, and Vietnam." China is the world's largest cherry importer, with a 2017 import volume of 101,885 tons, accounting for 25% of the global total.